I often wax poetic about my love of Community Supported Agriculture, vegetable deliveries, and the benefits of a vegetarian diet. Eat well! Save money! Support local farmers! 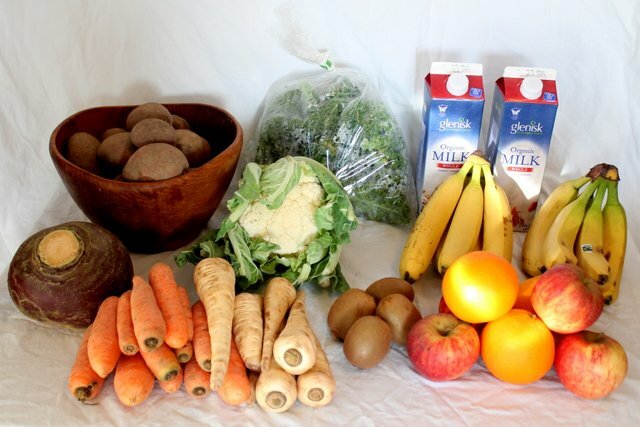 Bountiful abundance delivered to your doorstep! But I must confess, there are some vegetables for which I have zero enthusiasm. Like turnips. Look at these beauties. I’m sure if you like turnips, these guys are the kind you want to see. My sister-in-law asked me last week (while they were in town), what I planned to do with the turnips. My response: “I’ll probably leave them in the back of the fridge until they get wrinkly or moldy, and then I’ll throw them out.” Honesty is sometimes the best answer. Very little food gets wasted in this house. But turnips, radishes, jerusalem artichokes (sun chokes) and parsnips sit, abandoned. I even called our vegetable delivery service and told them not to include parsnips in our box for awhile. There are only so many parsnips I can eat throw out before giving up. The turnips are still in the back of the fridge. I’ll give them a few more weeks. In Ireland, sausage usually refers to either blood sausage, or “white” sausage, both of which are served at breakfast. There really isn’t a Jimmy Dean-style breakfast sausage equivalent available. Italian sausage is also hard to find here. You can make your own sausage with a few basic ingredients, and no scary equipment. I buy ground pork, or “pork mince” at my local butcher or Polish grocery store. I find that the ground pork I get at the Polish grocer is the best. For both of these recipes, I try to make the sausage at least 24 hours before I need it, as the time gives the ingredients time to come together. Below are two recipes I use to make my own sausage. 3/4 teaspoon ground fennel seed. I usually throw in about a teaspoon of whole fennel seed as well. Mix ingredients together, separate into three 1-pound (500g) portions. Freeze until needed. Mix ingredients together. Once combined, I roll this sausage into 3″ logs, and freeze. When I want sausage patties, I let it thaw slightly and then slice, and cook. Both recipes are really flexible. I add additional spices, or omit spices, depending on what is in my cabinet at the time! I hope your weekend is going well. It was a sunny but COLD day here. 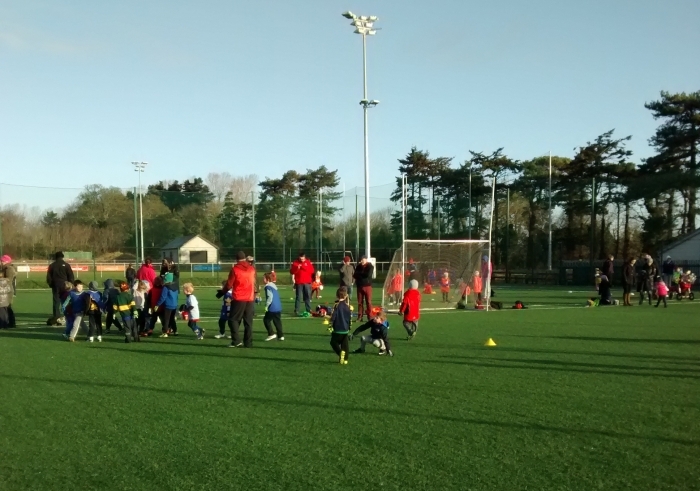 And I had to stand out in the cold during Isaac’s GAA practice this morning. Brrr! Also – don’t be fooled by the green grass – it’s astroturf. Friday Finds is one day late due to my previous post about my vegetable delivery. A shorter list of links from around the web this week, because I included my menu plan as well. Do you ever feel like you are “dating” for mom friends? A good article about making friends when the main thing you have in common is your kids. 3 American habits I lost when I moved to Finland. Made me laugh. 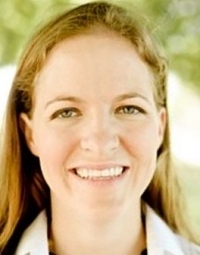 BTW – Matador Network is a great site for travel writing and expat articles. Why Do the Brits Drive on the Left? Learning to drive on the other side of the road was one of the most difficult things about living here. Also, a few of you asked, so here is the Menu Plan for this week, based on the delivery we got yesterday. The only additional vegetables I had to buy were mixed leaf salad and 2 leeks. Saturday: Beetroot, Jerusalem Artichoke, and Skirt Steak Salad, with Parsnip Cakes. Brad has been wanting to make something out of his new cookbook, The Irish Beef Book, and we had plenty of beets and Jerusalem artichokes leftover from last week’s box. The Parsnip Cakes (from The Country Cooking of Ireland) are basically mashed parsnips, dredged in egg and breadcrumbs, and fried. By FAR the best way to get rid of parsnips. Sunday: Bacon-wrapped dates and rutabaga oven fries. (The chipotle mayo in this recipe is so good!) A bit eclectic, yes – but trying to get rid of a few bits and bobs over the weekend. Monday: Pasta with peas, pine nuts, and garlic, from Jerusalem, by Yotam Ottolenghi. I don’t own this cookbook (yet), but I found this recipe here. I usually reduce the amount of garlic for the kids, but this is a recipe where almost everything can be kept on hand. Tuesday: Ham, leek, and barley casserole from BBC Good Food. I’ll be substituting kale for savoy cabbage. New recipe for us, but in general, recipes from BBC Good Food turn out well. Wednesday: Smoky Cauliflower Frittata from Plenty, also by Ottolenghi. Plenty is another great vegetarian cookbook, especially if you are willing to try new flavors. Thursday: Baked potatoes or leftovers. Friday: Pizza. Every Friday night is pizza night at our house. If you like this addition, let me know. I’ll think about posting it more frequently. In the meantime, if I try a recipe and like it, I will usually pin it to my What to Eat for Dinner board on Pinterest. On Monday I wrote about the benefits of eating less meat and about adding a vegetarian meal to your week with Meatless Monday. Today I’m writing about how to take a larger step and consider subscribing to a CSA, or vegetable delivery. I get questions often about our vegetable delivery – how it works, what we get, etc. CSA stands for Community Supported Agriculture, and provides a way for the consumer to buy directly from the farmer. Consumers pay for a “share” or subscription to a box of vegetables grown on the farm. The varieties of CSAs are numerous. If you live in the US, LocalHarvest.org has a great feature where you can locate a CSA near you. By subscribing to a CSA, you receive a weekly box of seasonal vegetables and other farm products. It is a great way to support local farmers and eat more seasonal, local vegetables. We subscribed to a CSA in Austin, and really enjoyed it. We have a similar service here in Ireland. One of the great things about subscribing to a CSA is that every week, you get a load of vegetables that you have already paid for! Your incentive to eat more vegetables is literally built into the program. Since you already paid for those vegetables, you might as well find a good way to use them. You don’t get to pick the exact vegetables or quantities that you receive, but that is part of the fun. Your selection changes “with the seasons”. For us, this means more root vegetables during the fall, dark greens in the spring, and tomatoes and squash in the summer. (Oh, and since this is Ireland – we get potatoes year round!) The variety is greater than most of us would normally choose at the store. Also, let’s be honest, even though I *know* beets are nutritious, the chances that I will voluntarily pick up a few from the store are… slim-to-none. The mix of vegetables can also push you out of your comfort zone. Like the time I got this in our box. (Romanesco – one of broccoli’s cousins). Or, the 4-lb Rutabaga (Swede). What do you do with 4 POUNDS of Rutabaga? Or the times you get something that you cannot identify – like this item last week, which I turned to my social media friends to identify. Turns out – it’s a Jerusalem Artichoke. This is a typical delivery for us. In addition to these fruits and vegetables, I usually have buy another pack of apples for school lunches and any specific vegetables that a recipe might need, but in general, it serves most of our veggie needs for the week. We drink more than 2 litres of milk per week, but it is super convenient to have at least some milk delivered. Using a CSA has completely changed my approach to food. Instead of looking at vegetables as side dishes, they are now the main course. Would you consider a CSA? If you currently subscribe to one, what do you like or dislike about it? **As I was thinking about this post, it occurred to me that I didn’t have any good pictures of what our fruit and vegetable delivery looks like, so rather than posting on Wednesday, I waited until I received our delivery today. I’ll post Friday Finds tomorrow. Let me just start this post by saying that I love meat – beef, poultry, pork, lamb, wild game – I’ll try pretty much anything. I was born and raised in West Texas, and I’ll be the first person to tell you that a really good grass-fed ribeye is AMAZING. But in the past 5 years, we have dramatically reduced the amount of meat that we eat on a regular basis. It started when we lived in Austin. Brad and I were both in graduate school, and money was tight (2 in graduate school + 2 young kids = no money), so meat was something we ate less and less of. We also subscribed to a CSA farm share. There’s nothing like staring a giant box of kale, tomatoes and squash (that you have already paid for) to prompt you to eat more vegetables! Meat is a calorie-dense food. It is higher in fat and cholesterol, and depending on the type of meat you buy, it can have plenty of hormones in it as well. Reducing the amount of meat you consume reduces your risk of cardiovascular disease, stroke, and some types of cancer. There are plenty of arguments around the the issue of meat consumption and environmental impact. Meat production, in general, uses more water, produces more greenhouse gases, and uses more fuel than farming. For example, it takes approximately 1850 gallons (7000L) of water to produce 1 pound (500g) of beef compared to 39 gallons (148L) of water to produce a pound (500g) of vegetables. It is no secret that meat costs more than vegetables, grains, legumes, and nearly everything else at the grocery store. Food prices here in Ireland are about 30-40% higher than in the US. Personally, I prefer to spend money on quality ingredients – organic vegetables, cheese, good pasta, etc, rather than eat ground beef (“beef mince” here in Ireland) every night, just for the sake of eating meat. This post isn’t really about trying to convince you to give up meat entirely. Like I mentioned above, I really like meat! What I am trying to convince you to do is to give Meatless Monday a try. It is an easy, no-commitment way to work more vegetables into your diet. Choose a vegetarian meal for one day a week. Today is Monday, and my Twitter and Instagram feeds are full of #meatlessmonday hashtags. Vegetarian meals do not have to be boring salads! There are loads of pasta dishes, casseroles, gratins, soups and stews, etc that make a great meal without the meat. 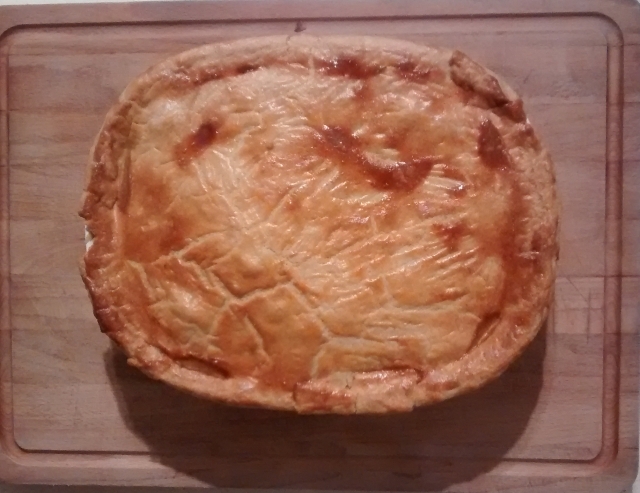 The picture above was a winter vegetable pot pie that I made for tonight’s dinner. PS – For those that are curious, yes the kids eat a vegetarian diet along with us. In fact, one of our kids doesn’t care for meat at all. I’ll write a post next week about the ways we have encouraged our kids to eat (or at least try) more vegetables. Happy New Year’s Eve! Are you celebrating tonight, or enjoying a quiet evening in? Whatever you’re up to, I hope you have a great time. I wanted to share a recipe I found last week that makes the most amazing onion dip. Here in Ireland, many of the standard American party foods are not available. There are no Fritos, Velveeta, proper Lays potato chips, ranch dressing (gasp! 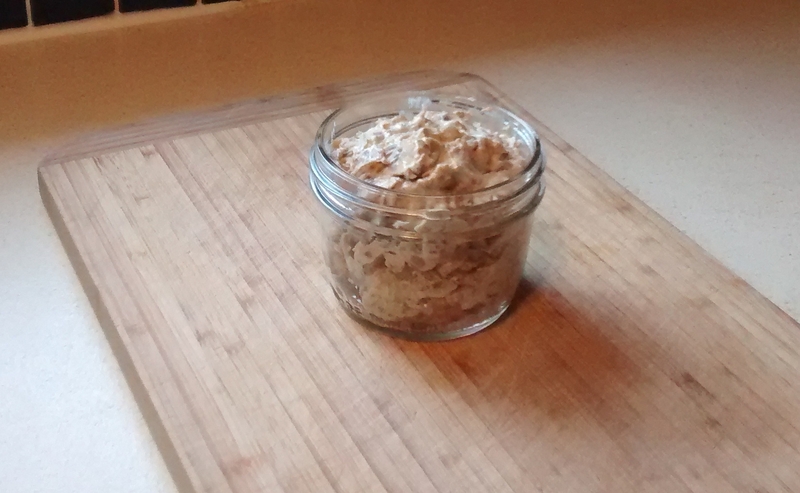 ), or french onion dip. Now – the Irish have plenty of their own “snack foods”, but they just don’t cut it when I’m craving good ol’ American-style snacks. We had a small get-together on Christmas Eve with some friends, and we wanted to serve some dishes that reminded us of home. 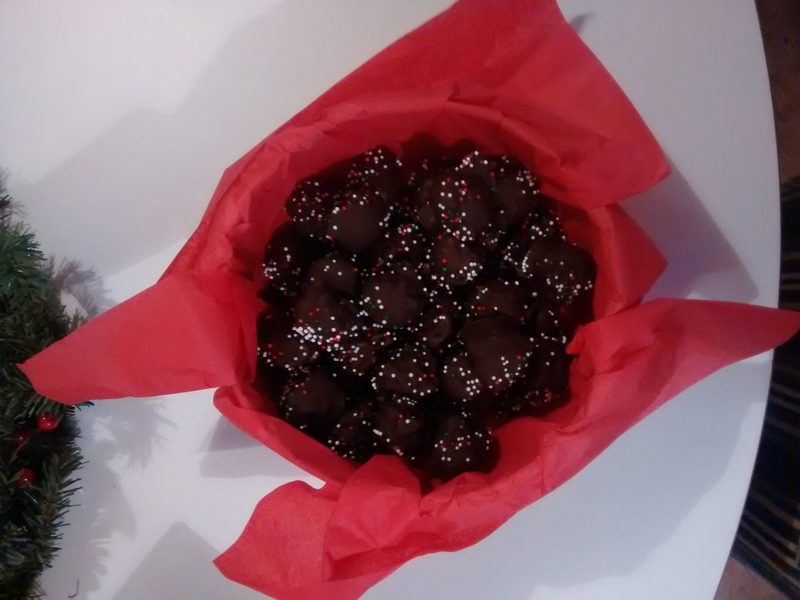 I ran across this recipe in a Holiday Entertaining magazine from last year, and had to try it. The results were amazing – this is so much better than the stuff you can buy at the store. Don’t be put off by the amount of time it takes. Seriously. While the onions roasted, I finished other things in the kitchen. You could make this dip for your New Year’s Party tonight! Serves 16 – but let’s be honest, 2 people could pack it away with enough motivation! 2 lb large yellow onions, thinly sliced. I used our mandoline, but you could also use a food processor. 2 large shallots, thinly sliced. About 6 oz/170g total. 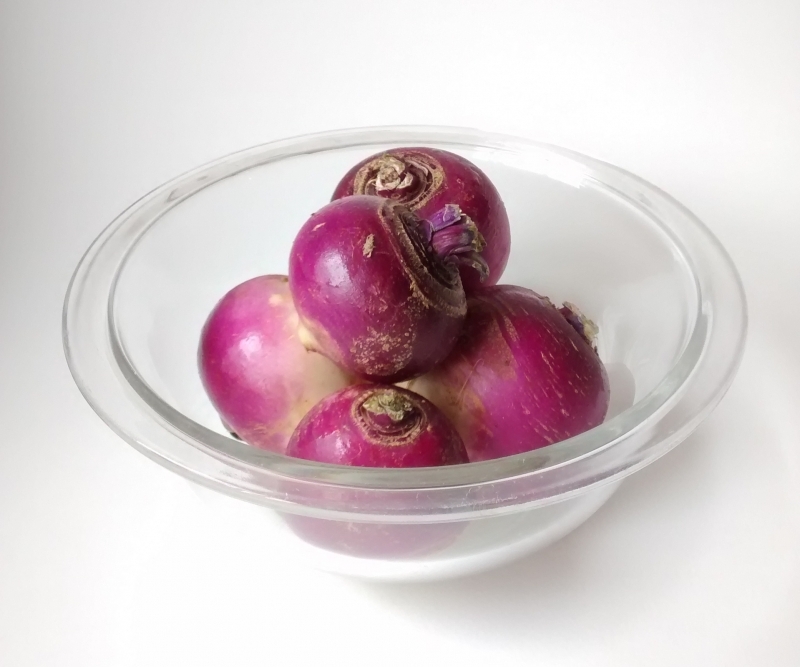 Our shallots are tiny – I think I used 6. Preheat oven to 425F/220C. Mix onions, shallots, thyme sprigs and oil in large roasting pan or rimmed cookie sheet. Season with salt and pepper. Roast onion mixture, stirring and scraping down sides of pan every 10 minutes until mixture starts to break down and turn golden brown, 45-55 minutes. Discard thyme sprigs. Add wine and vinegar; stir to scrape up any browned bits from bottom of pan. Return onion mixture to oven. Continue roasting, stirring occasionally, until deep golden brown and completely caramelized, about 15 minutes longer. Let onion mixture cool to room temperature. Transfer onion mixture to work surface and mince. Transfer to medium bowl. Stir in sour cream, chives, yogurt, and onion powder. Season with salt and pepper. Dip can be made up to 3 days ahead. Recipe can be found online here. It’s 5:30, you’re staring at a few hungry, grubby faces and thinking, “What are we having for dinner?” I’m usually a big believer in menu planning. However, there are plenty of days when I don’t have a plan, but everyone still needs to be fed. If we lived in the US, we might go out to eat, but in Ireland, there really aren’t many of the “fast-casual” restaurants. There are no Chili’s, Applebees, etc. The closest thing to the fast-casual restaurant is the local pub. Some pubs have great food, and some do not. Our local (as they are called here), has great atmosphere, but the food is a total dud. Fast food is not very common either. So, it is handy to have a few go-to kid-friendly recipes around to get dinner on the table quickly. We are vegetarian most of the time, but most of these meals could easily incorporate meat. For the record, I define fast as: “Idea – to – Table” in 45 minutes or less. 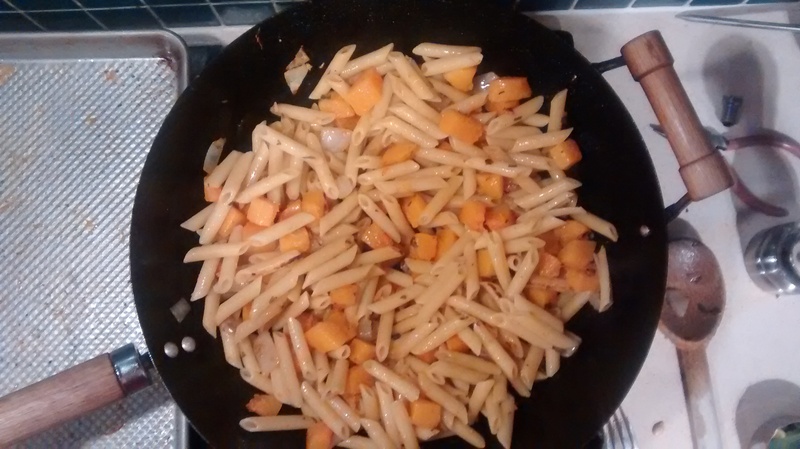 Pasta with Butternut Squash, Pine Nuts and Sage Leaves. We almost always have these ingredients on hand, thanks to the sage bush in our back garden. Lentil Sloppy-Joes. I was really skeptical of this recipe before we tried it, but it is so good! It tastes as good or better than sloppy joes made with manwich and ground beef. Since this recipe uses lentils and canned tomatoes, you can keep almost all the ingredients in your pantry until needed. Also, this recipe freezes really well, so you can make a double batch and stick it in the freezer for a super-quick meal. Frittata. We don’t really use a recipe any more, but I have included one to get you started. The main difference between this recipe and ours is that we thinly slice our potatoes in the food processor and saute them until crisp along the edges. With a food processor, this dish is so easy to make. Pasta with yogurt, peas, and chile. My kids love peas, and they love yogurt, so they really enjoy this recipe. If you eat vegetarian regularly, you need to check out Yotam Ottlenghi’s recipes and cookbooks. We have Plenty and love it. He has a new one coming out this year, Plenty More. Baked Ravioli. Another great recipe to help break out of the “pasta and tomato sauce” rut. For more ideas, you can follow my Pinterest Board, “What To Eat for Dinner 2014“. I post recipes that we cook for dinner that are available online. What are some of your go-to recipes? I’m always looking for new ideas! A few weeks back, I wrote about school in Ireland and alluded to the differences in the lunch system between here and the US. The few months leading up to Isaac starting school, I envisioned that Isaac would eat lunch in the cafeteria, just like I did in the US. In fact, when I went to register him for school, it didn’t even occur to me to ask about lunches. Of course he would either bring his lunch or eat at school – in the cafeteria! Except…not. Here in Ireland, most schools do not have a cafeteria, (also known as a canteen). Instead, all students bring their lunch and eat in the classroom, at their desks. They can have a small portion of their lunch during their first break, and the rest during their lunch break. I usually include some chopped veggies such as carrot sticks, bell pepper sticks, cucumber or celery, along with fruit or yogurt. He also takes a water bottle. Obviously not every school has this policy. I know of several schools that provide hot lunches, and schools in economically disadvantaged areas have also started breakfast clubs to ensure students have the opportunity to eat breakfast. In general, parents do not come to school and eat lunch with their child, or bring fast food to share with their child. The school day is much shorter anyway, so if I want to take Isaac to McDonald’s, I can do that after I collect him at 1:30. 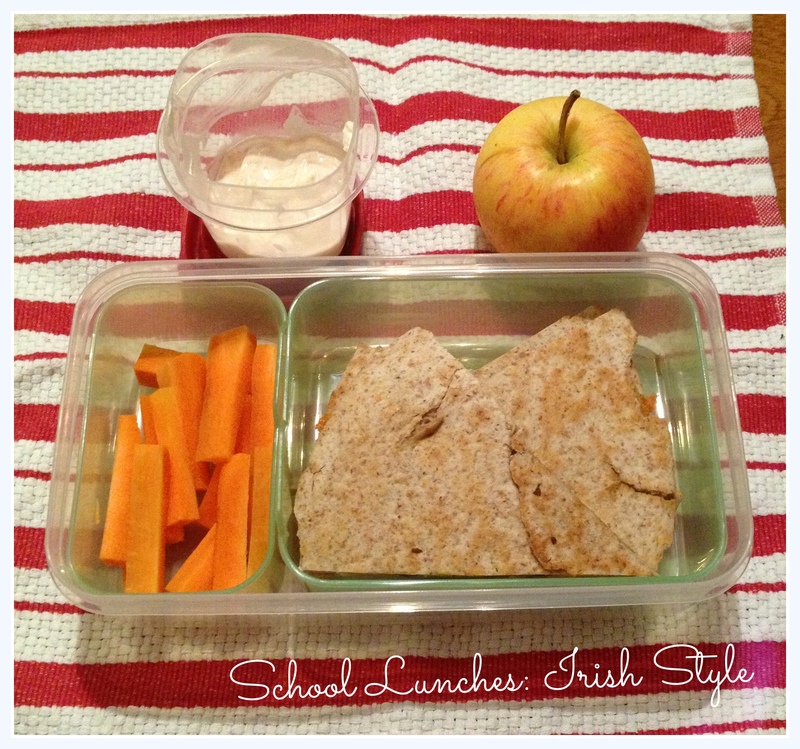 School lunches in Ireland – yet another thing that I didn’t expect to be different, but we have grown to like it anyway.